SubConn introduced SubConn Micro ‘G2’ connectors to streamline its range of micro connectors. The SubConn Micro ‘G2’ connectors have enhanced sealing capability and use a uniform pin size and design. 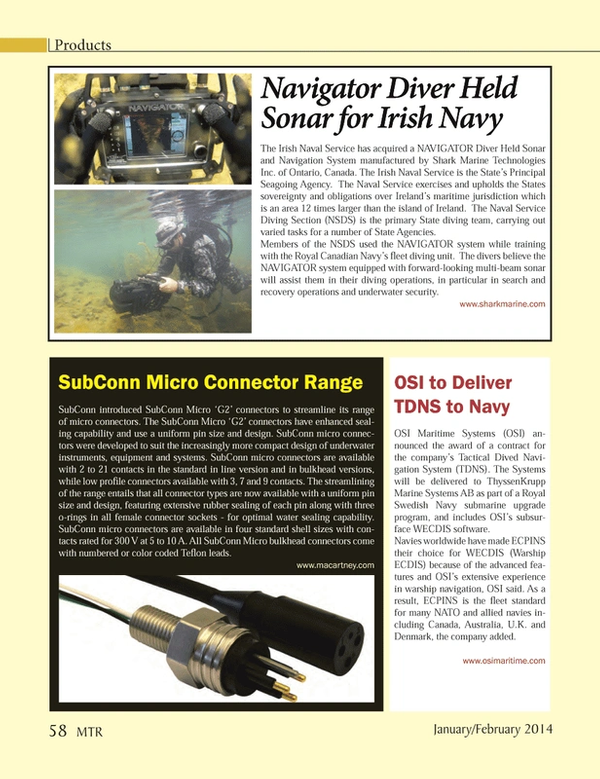 SubConn micro connectors were developed to suit the increasingly more compact design of underwater instruments, equipment and systems. SubConn micro connectors are available with 2 to 21 contacts in the standard in line version and in bulkhead versions, while low profile connectors available with 3, 7 and 9 contacts. The streamlining of the range entails that all connector types are now available with a uniform pin size and design, featuring extensive rubber sealing of each pin along with three o-rings in all female connector sockets - for optimal water sealing capability. SubConn micro connectors are available in four standard shell sizes with contacts rated for 300 V at 5 to 10 A. All SubConn Micro bulkhead connectors come with numbered or color coded Teflon leads.